The end result, to be blunt, is a often mess that converts the business owner from master to slave. To keep the business surviving and prospering, the business owner is locked into a dependent relationship that means more hours, more hard work, more energy and effort. 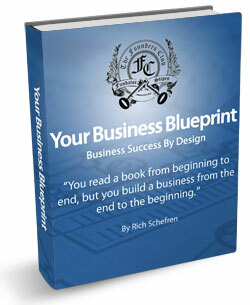 Rich Schefren has written this report / ebook, “Your Business Blueprint” to stop you falling into this trap. You must start with the end in mind. That may seem a little strange until you stop to think about it. When you navigate for a car journey, you must have a very clear view of where you are going. You then look at how to close the gap and that usually involves decisions working from both ends. You can get a copy of this report by taking up the trial offer of the Founder’s Club (affiliate link). This is Rich Schefren’s private monthly membership club where he shares his best ongoing ideas in the form of new reports and weekly audio dispatches. If you are not familiar with Rich Schefren, he is the most successful business coach for Internet marketing entrepreneurs. He has helped to create many of the current gurus but he’s also consulted with top Internet companies like Google. 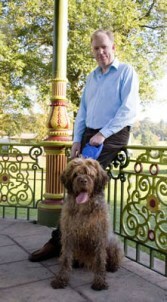 His most famous training product is the Business Growth System coaching program. What’s In Your Business Blueprint? Here he reiterates the principle from his most famous free report, the Internet Business Manifesto. You must build your business strategically from having a vision to avoid the trap that ruins many people’s dreams. That trap is about being an opportunity seeker, jumping from one opportunity to another without having the commitment and determination to see any through to the end. Instead, these people become victims to “shiny pill” and “magic button” marketing full of hype, promoting the hope of quick and easy success. Michael Gerber and his concept of the Primary Aim from his book, The E Myth Revisited. Frank Kern and his concept of Core Influence. Rich takes both ideas, extends them and makes them easier to work with. Provided you do the exercises, you will become much clearer about what you want to achieve with your life and how you want to live it, day by day. This clarity gives you the power to focus your thinking on how your business can support this life. While your selfish reason for owning a business is to give you the rewards you want, it also needs to have a clear customer focused purpose. Your business only deserves to exist if it helps your customers to get what they want. You must be clear who your customers will be and what they want to achieve. This means research. Rich Schefren makes the excellent point that many people go about market research and customer research the wrong way. Almost inevitably they turn to Google and start searching for answers but either what they find is superficial or they don’t find anything. He uses the analogy of being a detective. A policeman investigating a murder doesn’t expect to go to Google and type “who killed John Smith?” Instead the detective searches for clues that lead to a deduction and finding proof. You should do the same in your customer research and Rich suggests you use the Michael Masterson idea of a core complex – this is about finding evidence of the beliefs, feelings and desires of your target buyers. This section takes what you learnt about your customers and what they want and teaches you how to turn helping them into a compelling purpose that inspires, them, you and your employees. This section talks about how you develop your unique selling proposition. It then looks at how your develop a profit model to make it economically feasible to give your customers great value for money while building a business than will give you your dream lifestyle. He goes into detail about what a clever profit model he is using to build the Founders Club. Unfortunately this refers to the first version of the Founders Club and not the current version. Rich obviously had his reasons for changing (he lost his partner on this Todd Brown who was sharing the load). In my opinion, the first profit model design in much better than the current version in terms of creating a self sustaining business that has the potential to grow exponentially. This is the section that helps bring everything together by identifying the individual activities that are required in your business to meet the needs of you and your customers. You focus on what needs to be done and who will be doing it. This helps to keep everyone accountable and makes sure that no critical activities fall through the gaps of individual responsibilities. It also measures how well you are able to step away from your business. I like what Rich has done with this but once again, he is building on an idea popularised by Michael Gerber and the E Myth consultants. What’s different is that Michael Gerber focuses on job titles, even if each has your name against it at the beginning. Rich Schefren specifies activities and I believe this is more helpful and useful although it does take more work. 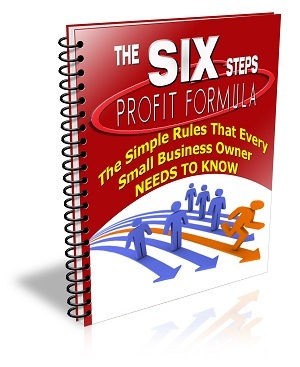 It is an excellent read – 76 pages in an A4 formatted pdf. It will guide you through an effective business planning process that is likely to have much more impact on you than the traditional business plans. I’d have liked it to take a more strategic approach to looking at how the market is likely to change in the future. When you’re designing a business like this, you must be future oriented. In 2008 it as clear that the boom was unsustainable and people could have been better prepared for the recession, even if what actually happened and the long term impacts were harder to predict. Some of his other reports are less derivative in my opinion. I believe in giving credit and I can see the sources of some of these ideas. If you’re an ambitious entrepreneur with some connection to the Internet (you don’t have to be a pure Internet entrepreneur), I recommend you join the Founders Club and at least try his thinking and ideas. and his weekly audio dispatches which are also available to read if you prefer. I am an affiliate and if you join after clicking through from my link, I will earn a small commission. Previous post: Is The USP Really Dead? Of Course Not!